Snow in Kenya - Is There Any? Where is There Snow in Kenya? Snow in Kenya is not a particularly common sight, given that the east Africa country sits right on the equator and has vast stretches of semi-desert scrubland. And yet, there is one spot where you can always find snow in Kenya. Mount Kenya is the tallest mountain in Kenya, and the second highest in all of Africa. Only Tanzania's Mount Kilimanjaro towers higher. The top of Mount Kenya is perpetually snow-covered due to the high elevation. In fact, the Meru people call the mountain "Kirimara", which translates from their language to "that which has white stuff", in reference to the white peaks. The snow cap changes seasonally, but there is typically only snow on Mount Kenya above an elevation of 5,000 feet. The idea of snow in Kenya is so remarkable, that the 19th century explorers Ludwig Krapf and Johannes Rebmann were not believed when they reported back to Europe about the icy peaks of Mount Kenya and nearby Mount Kilimanjaro. 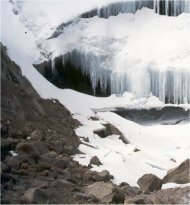 Besides the snow, there are also a number of ice glaciers on Mount Kenya. There are 11 named glaciers, with most of them named after various explorers. They are Northey, Krapf, Gregory, Lewis, Diamond, Darwin, Forel, Heim, Tyndall, Cesar and Josef. The largest is the Lewis glacier. Due to changing weather patterns and global warming, all of Mount Kenya's glaciers are shrinking rapidly. 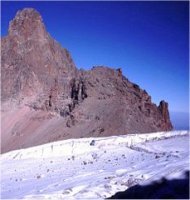 Most typical hiking trails up Mount Kenya do not go high enough up the mountain that travelers need to worry about the snow. Anyone planning to ascend the peaks will need complete mountaineering gear, which typically includes cold-weather gear. (The only exception is Point Lenana, which can be reached through regular hiking.) Crampons and ice axes are necessary equipment because of the many glaciers among the peaks. Though Mount Kenya is considered to be the only place with snow and ice in Kenya, there's been one exception. In September of 2008, there was a freak hailstorm in the central Kenyan village of Busara. More than 100 acres were covered in icy white "snow". The layer of slush stayed on the ground for hours, even in the hot sun. Most of the villagers had never seen snow and were extremely confused by the event.